Prof. Ali A. Minai received his Ph.D. in Electrical Engineering at postdoctoral training in computational neuroscience at the University of Virginia. Dr. Minai has published over 100 peer reviewed papers and edited eight books in the area of complex systems. He received an INSPIRE research award from the National Science Foundation in 2012. Dr. Minai was President of the International Neural Network Society in 2015 and 2016. Currently he is a member of the society's Board of Governors. He has helped organize several conferences on complex systems, and served as the General Chair for the 2011 International Joint Conference on Neural Networks (IJCNN 2011) and the 2011 International Conference on Complex Systems (ICCS 2011). He is an action editor for Neural Networks and for Cognitive Systems Research, and an associate editor of the IEEE Transactions on Neural Networks & Learning Systems. He is a senior member of the IEEE, and the International Neural Network Society, and a member of AAAS and the Society for Neuroscience. 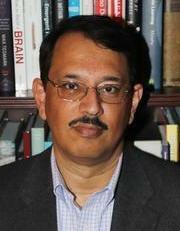 Dr. Minai is also a member of the University of Cincinnati's neuroscience graduate faculty.